I don’t like cricket, I love cricket. Summer in Australia conjures up images of beaches, barbecues and backyard cricket. A tradition born from a desire for families to gather round their outdoor barbecues, backyard cricket is almost a trademark Down Under. Many rising cricket stars were first discovered knocking the ball around in mum’s and dad’s back yard. And possibly the most famous of them were the Chappell brothers – Ian, Greg and Trevor. In his book, Fierce Focus, Greg Chappell explains how backyard cricket played a part in his progress to international recognition as one of the most elegant and successful batsmen of all time. Chappell also describes the “pecking order” in his family – the elder Ian had first pick at batting, with his brothers bowling to him and later when Ian gained a spot in the South Australian team it was the younger Trevor bowling to Greg. Backyard cricket remains very much a seasonal pursuit, with its popularity revolving around the summer holidays such as Christmas and Australia Day. Yet, it lacks the level of passion and dedication displayed in Sri Lanka and its neighbours India and Pakistan. 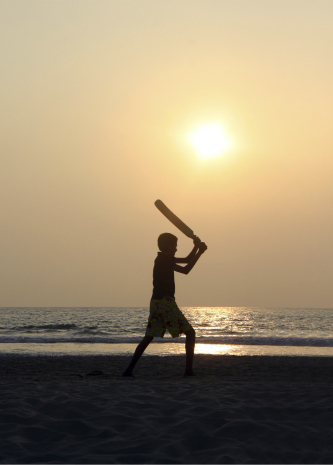 In Sri Lanka, cricket is not just played in the back yard; it is played on the roads, beaches, alley ways, paddocks and strips of land; in fact, it is played anywhere a set of stumps can be planted and a decent bowler’s run-up can be had. It is cricket, lovely cricket everywhere, even on church grounds and empty land in cemeteries. One example of a classic cricket venue is Galle Face Green on any given holiday. It is a magnificent melting pot of activity where families gather to shoot the breeze, fly their coloured kites, and mingle among the rustic food vendors. It also is where potential future Malingas and Sangakkaras showcase their talents. 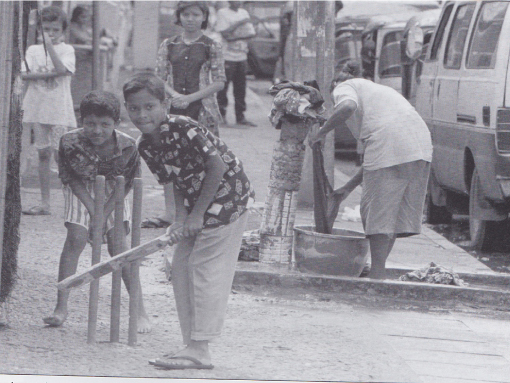 As far back as I remember, cricket played a major part in my growing up. My interest in the game peaked in the late 1950s when I, as a young lad, had my ear glued to the wireless listening to the scratchy shortwave ball-by-ball broadcast of Tests between England and Australia. And, I was not alone. All my friends down the street were doing the same. There were many of us; we all wanted to be an Alan Davidson, Richie Benaud, Neil Harvey or Len Hutton and very soon we were playing “Test” matches of our own. Beach hit … a batsman cuts a striking figure during an impromptu game of beach cricket. Picture contributed. We had the good fortune of having an empty stretch of land at the bottom of our street, Vaverset Place, in Wellawatte. It was about 40 metres long and 15 metres wide – one boundary was the fence of the last house and the other was the railway line, with the rocks and Indian Ocean further back. We easily fielded two teams made up of boys from our street and the neighbouring lanes. There was a jostling for places as a few missed selection. I remember feeling so honoured when I was picked to open the batting and the swelling pride when I scored a half-century on debut. Runs were made from flicks off the legs for two runs to the neighbour’s fence, square cuts over the railway lines for two more and straight hits to the long boundary. A couple of fielders were placed on the edge of the railway lines, serving two purposes – to intercept the ball before it disappeared among the rocks on the beach, and warn of approaching trains so play could be stopped. We soon learned to play straight down the ground and this technique held us in good stead in later years. I had seen this used to good effect before I had turned 10, when my older cousins Richard and David Heyn would visit our home. Our side garden had a longish driveway to our garage, close enough to the 22 yards needed for a game of cricket. As Greg Chappell indicated, there was a pecking order even in Sri Lanka and I was relegated to fielder and ball retriever. I would watch in awe as the tall and rangy Richard powered the ball over the bowler’s head and sometimes a mistimed drive would break a windowpane on the side of our house. We were quite brave, playing with a leather ball in such a restricted area. Richard continued to show his prowess at St Peter’s, often striking straight sixes and sending the ball splashing into the Wellawatte canal. Our unfortunate groundsman would have to hitch his sarong ammude-style and wade in to rescue the sodden ball, eyes all the time warily scanning the murky water for the kabaragoyas that could inflict quite painful bites. The Test matches down Vaverset Place became great events, with the parents of the players turning up to watch. Among them was the respected neighbourhood “elder”, Dr W L Fernando, the proud father of Bandula Warnapura and his two brothers, Sarath and Upali, who all were in my team. Dr Fernando was “uncle” to us all and encouraged us to pursue our cricketing dreams. Any spot will do… A busy footpath does not deter these youngsters from their favourite pursuit. Picture contributed. As we all know, Bandula went on to become Sri Lanka’s first Test captain. He was my closest friend and often opened the batting with me as we formed Sisira Sports Club and went on to play Tests against other teams that had sprung up around Colombo. This was serious competition as our rivals sported schoolboy cricketers of the highest calibre; one who I remember flaying our bowling attack was the talented Jagath Fernando who went on to captain Royal College. So we ventured further afield from our home ground, taking on the opposition at such diverse venues as the Bambalapitiya Flats playground, Frazer Ave field in Dehiwela and the popular Peterson Lane paddock, where facing the fast ball skidding off the rich, thick, buffalo grass was a testing experience for any opener. Matches were won and lost but it always was a rewarding experience. We played the game hard but it was devoid of any sledging. Friendships were forged among opposing players and we respected and admired the others’ skills. We younger members of the team always felt safe, protected by our siblings and older teammates, and we learned quickly to look after ourselves in the battle arena. This grassroots cricket soon became a phenomenon in the ’60s and the emergence of so many teams started a movement that was to install a whole new layer of softball cricket under the more traditional competitions. There was the hotly contested tournament named after a leading politician of the day, and it was a real carnival atmosphere at the venues, vibrant but not cheesy like the razzamatazz of the Twenty20 matches of today. Cricket continued to fashion our lives as we progressed to the senior years of schooling and most of our team members gained spots in college teams – at St Peter’s, Ananda, Nalanda and Royal, to name a few. We took our skills into the next league, all with the one purpose of enjoying ourselves. Some of us did not have the proper equipment and we had “to make do” with what we had. In younger days we carved out bats from pieces of timber and made our own stumps and bails as money was not the most available commodity. This bat was my pride and joy and I took it everywhere, including to daily college practices. It was the era when bats had to be seasoned and armed with a bottle of linseed oil, bought from Diana sports shop, I would lovingly apply the oil along the face of the bat. I suspended a ball in a sock from a beam on our front porch and every evening I would practise a front-foot stroke, always keeping my elbow straight so the metronomic swing of the ball would bring it back to the same We played the game hard but it was devoid of any sledging. Friendships were forged among opposing players spot on the bat every time. Cutting through the silence of the night was this sound, “tock … tock … tock …” emanating from my home and from Bandula Warnapura’s house across the road as we went about our nightly ritual. This was our technique to develop the “sweet spot” on our bats and also ensure we kept our concentration and reflexes sharp. But, with time and age, the bat face started cracking and chips were coming loose. But we addressed this by binding the bat with twine and gluing it down to keep the fragmenting willow together. I was covering that landmark day, February 17, 1982, when my boyhood friend Bandula went on to the P. Sara Stadium with Englishman Keith Fletcher for the toss of the coin in Sri Lanka’s first Test match. For me, cricket was filled with highs and lows but one high was the fact I could write about it in a career as a sports journalist for one of the leading national newspapers. I continued to enjoy the euphoria only a cricket lover could experience. I was there for the breakthrough days when Sri Lanka gained full status as a member of the International Cricket Conference (now Council). 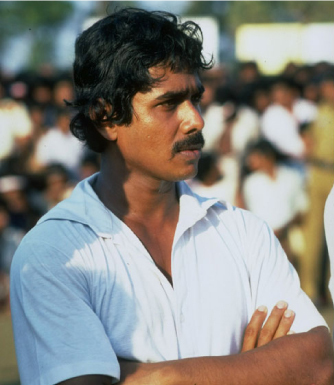 I was covering that landmark day, February 17, 1982, when my boyhood friend Bandula went on to the P. Sara Stadium with Englishman Keith Fletcher for the toss of the coin in Sri Lanka’s first Test match. Cricket has changed a lot in the past 50 years. Some changes have been for the better, some for the worse, with sledging of rival teams the ugliest aspect. We have won two World Cups and the sport continues to enjoy immense popularity. But, I will always cherish those boyhood years when the game was at its most innocent and we played it because we loved it with a passion. On a recent visit to Sri Lanka a slogan on a T-shirt caught my eye. It simply proclaimed: “If there is no cricket in heaven, I am not going.” How apt. But I think heaven would not want to miss out on cricket’s pulling power – it truly is a divine sport. Previous Winds of change blowing but SLC must proceed with caution..